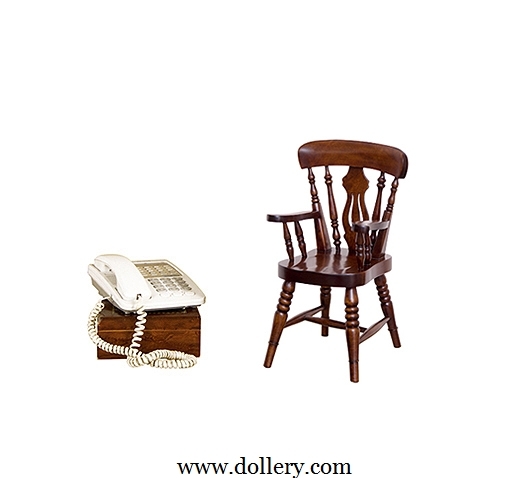 We now have Doll Chairs to sell! 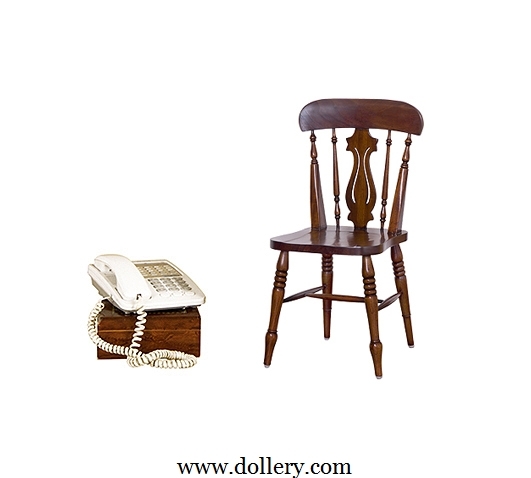 If the chair is in stock with the company we can ship right away. 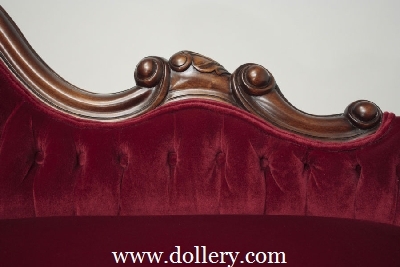 If you want a custom made chair that is not in stock in can take approximately 3 - 4 months to receive a chair or sofa. Custom orders must be made in multiples of 10 of each style. Because all orders are custom made at the time of your order, all chair & sofa orders are FINAL SALES. No Cancellations. No Refunds. No Discounts. 50% deposit required. 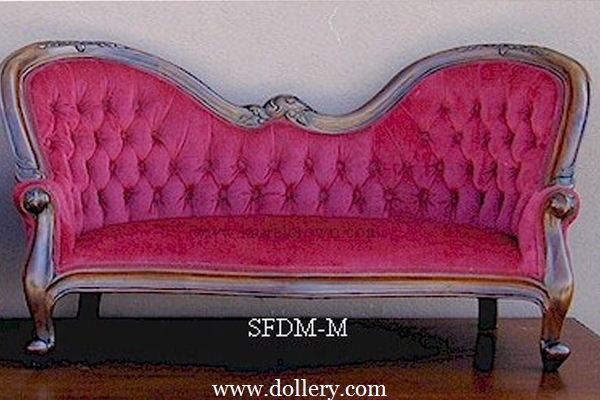 Shipping is approximately $70 per sofa and $50 per chair if shipped within the USA. Exact shipping outside USA varies but will be more. 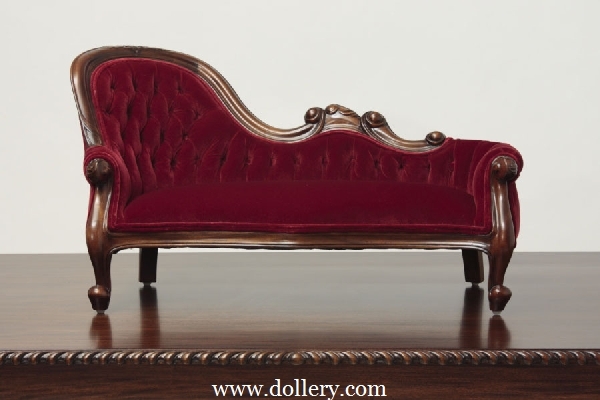 International Customers: We can ship the chairs outside the USA but we cannot ship the sofas abroad. The boxes needed to ship the sofa's are too big to meet the post office size restrictions when shipping over seas. To ship the 1/2 scale sofas via UPS is approximately $500 depending on country. Still, if interested, please let us know and we can figure out the pricing for you. 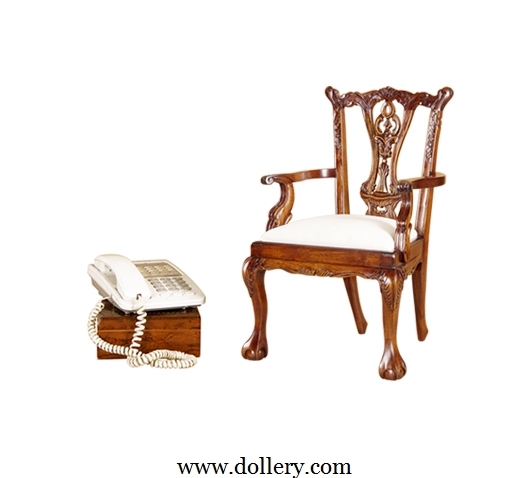 Call 781-447-6677 or email kmalone@dollery.com. 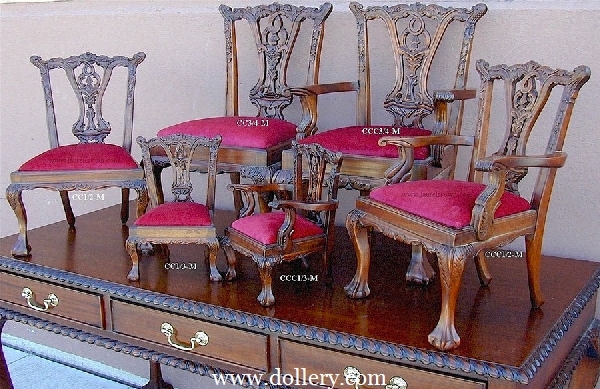 All items shown on this page (both chairs and sofas) are made from solid Plantation grown Honduran Mahogany wood with a classic mahogany stain and a satin semi-gloss finish. 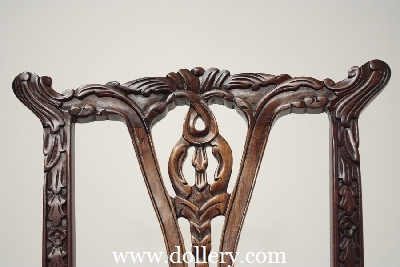 Above - These are Miniature Chippendale Side and Arm chairs shown in the 3 sizes that are available. 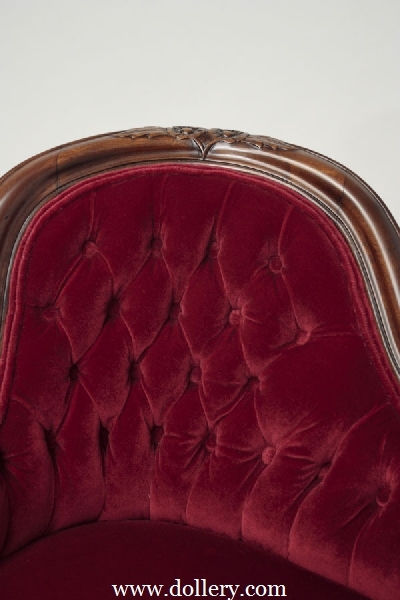 Shown in Burgundy Velvet upholstery. 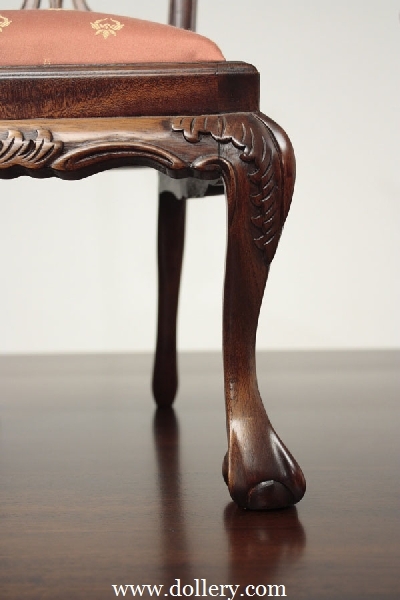 Classic cabriole front legs with claw-and-ball feet, a serpentine top rail, and hand carved acanthus scrollwork all along the backrest, even the back side of the chair is carved with details. These tiny antique style toy armchairs have upholstered seats and go well with the upholstered miniature sofas pictured below. 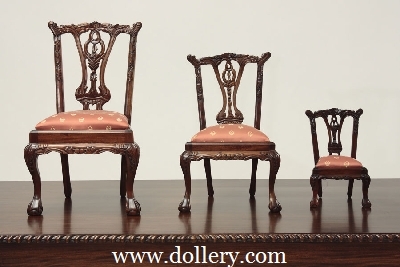 Above - These are Miniature Chippendale Side chairs shown in 3 of the 4 scales that are available; 3/4 scale, 1/2 scale and 1/3 scale. Shown in Batavia Red upholstery (salmon with a gold stamp). Genuine Leather in Black, Brown, Red or Green (this is available but at a higher price). 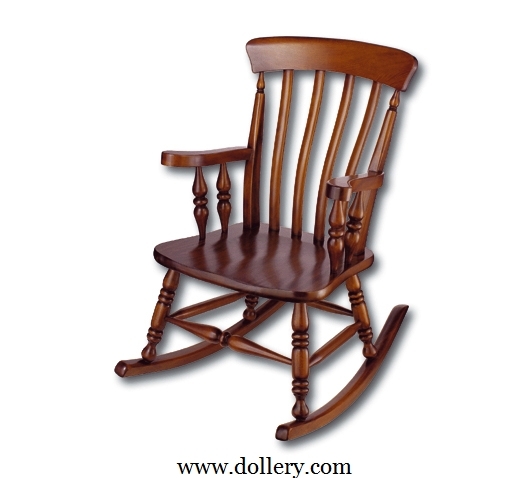 Handmade from solid mahogany wood, each fan-back side chair is equipped with a miniature saddle shaped wooden seat, an arched top rail with spindles, and splayed baluster and ring-turned legs joined by an H-stretcher. 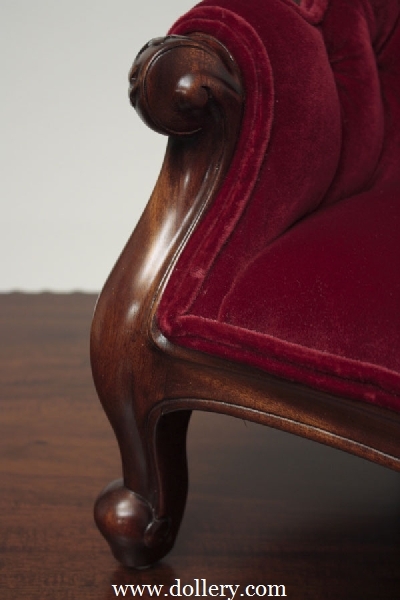 Handmade from solid mahogany wood, each fan-back armchair is equipped with a miniature saddle shaped wooden seat, an arched top rail with spindles, and splayed baluster and ring-turned legs joined by an H-stretcher. 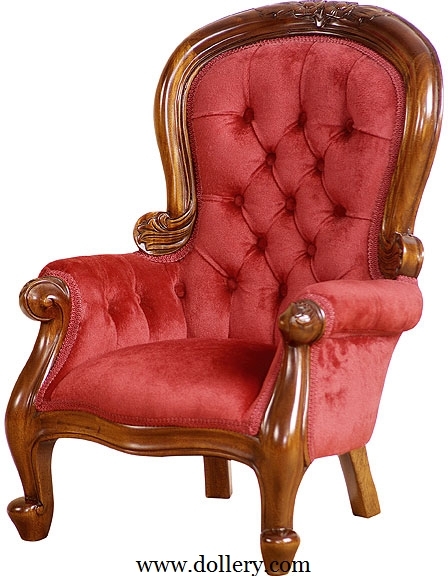 Handmade from solid mahogany wood, each fan-back armchair is equipped with a miniature saddle shaped wooden seat, an arched top rail with spindles, and splayed baluster and ring-turned legs. Rockers. 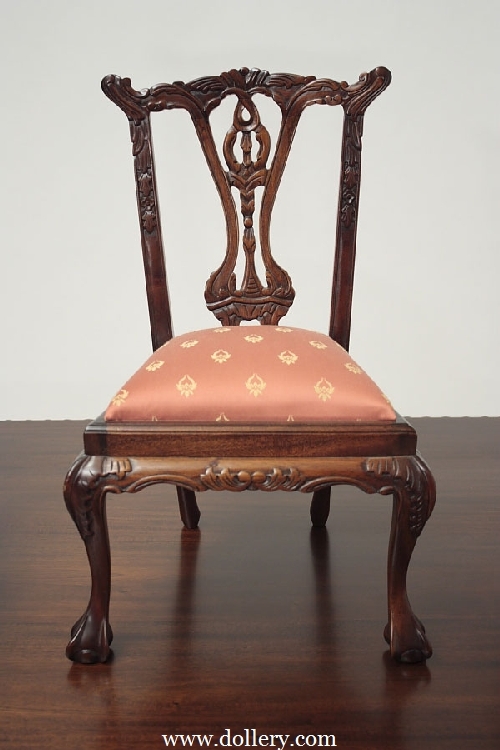 3/4 scale 17.75"W x 25.75"D x 29.50"H.
This chair has a solid mahogany frame with miniature hand carved details, cabriole legs, scroll feet, and even upholstery with tufting. 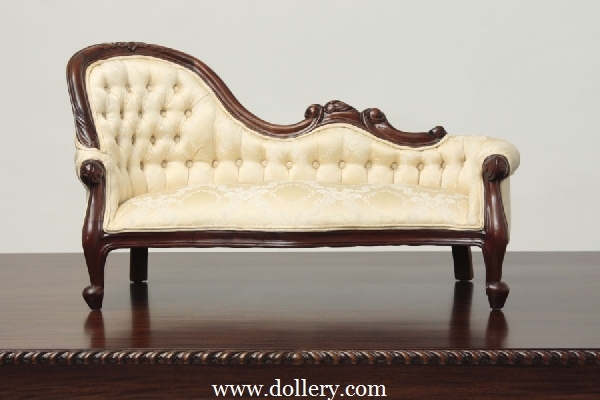 This sofa has a mahogany frame with miniature floral carvings, a serpentine seat, scroll foot cabriole legs, and real tufted upholstery. Please allow 4 months for delivery of sofas. A doll with a measurement of 7" (18cm) from her knee to the bottom of her foot would sit in a 1/3 scale chair or sofa. A doll with a measurement of 10" (25cm) from her knee to the bottom of her foot would sit in a 1/2 scale chair or sofa. A doll with a measurement of 15" (38cm) from her knee to the bottom of her foot would fit in a 3/4 scale chair or sofa. A doll with a measurement of 5" (13cm) from her knee to the bottom of her foot would sit in a 1/4 scale chair or sofa. This size is available to order but is only $5 less than the 1/3 scale prices. Please call 1-800-447-3655 (outside MA) or 781-447-6677 x22 or email kmalone@dollery.com to place an order. 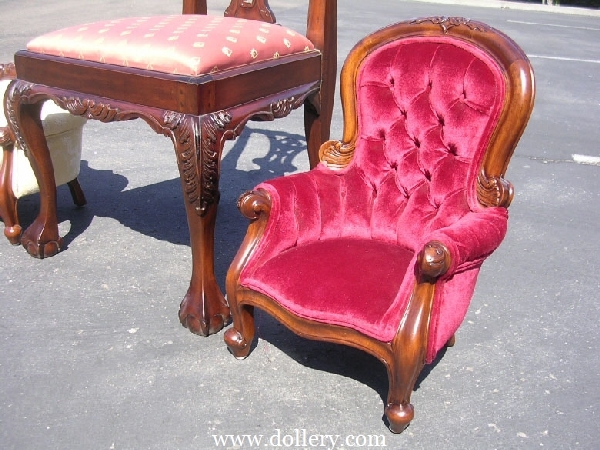 This image shows a 1/2 scale Miniature Victorian Spoon Back Arm Chair upholstered in burgundy velvet next to a standard adult size Chippendale Side chair done in Batavia Red upholstery. You can also see a 1/2 scale sofa off to the other side.